The living room is most likely the main gathering place in our homes. It is where we like to relax and socialize with friends and family. Of course, it should be styled and decorated in accordance with personal tastes. But, we always suggest these ideas to our clients for how to make a living room complete, comfortable, and beautiful. Over the years, we have written about all of them, but just for a little refresher, here we go. Every room should have a focal point that captures your attention and draws you into the room. It could be a fireplace, a large window, a beautiful piece of art, or an interesting mirror. Every living room should have several comfortable places to land. The seating groups should be arranged for easy conversation and grouped around the focal point so that people will naturally want to hang around for awhile. A mix of overhead lighting, ambient lighting, and task lighting is a must. We generally do not prefer the harsh lighting provided with the overhead lighting, but there may be times when it is necessary. Ambient lighting is warm and inviting, so we recommend having several lamps or candles in the living room. If there is a desk in the space, task lighting for reading or writing will complete the layered lighting plan. We love to see a variety of textures in soft rugs, throw pillows, plants, and blankets to amp up the warmth and coziness in the room. We believe that every good living room should showcase a mix of old and new. We appreciate it when our clients have personal collections or inherited family pieces. Antiques, books, old photographs or objects collected from travels help to build the room’s character. Our homes are extensions of our lives and there is no better way to show our personalities than through these items. We designers often offer this piece of advice – if your room feels like it is still missing something, try adding a big or small touch of black. It could be a piece of accent furniture, some picture frames, a lampshade, or a vase. The black will ground the space, add depth, and lend sophistication to any color scheme. In both of these photos, we can see these elements – a beautiful focal point, a comfortable seating arrangement, good layered lighting, some personal collections, various textures, and some touches of black. We have been sourcing dining room chandeliers for two clients – two totally different chandeliers, both very good looking. One of the clients wanted a very contemporary chandelier while the other expressed an interest in a traditional crystal one. Keep an eye out for a future blog where we will go into more detail about the myriad of other styles of chandeliers, about finding the right size chandelier, and also about various types of crystal. But, for now, these are a few of the ones we found in each style. We know there is a perfect chandelier for every taste. We have admired and purchased a number of beautiful crystal chandeliers, and we have also seen many ceiling fans in industrial or modern styles, but these two ceiling fans are really unusual. We saw them both at www.horchow.com, an upscale online and catalogue source from Dallas, Texas. The first one is their Julianne Bronze Fandelier (definitely appropriately named) with a cut-crystal light kit, and the second one is the Chantel ceiling fan with golden metal accents and crystals. They are on sale for $400 and $287.20, respectively. Let us know what you think of mixing a functional ceiling fan with such ornate elements. Sometimes we think we are behind the times with design trends, and sometimes we think we are way ahead of the curve. For example, several years ago, we trimmed this sofa for our client’s very traditional living room with a beautiful bullion fringe to really dress it up. Of course, we realized this was not a new idea – fringe was often used liberally on Victorian and Edwardian furniture and lampshades. But, at the spring markets, fringe was back in more unexpected and bold ways. 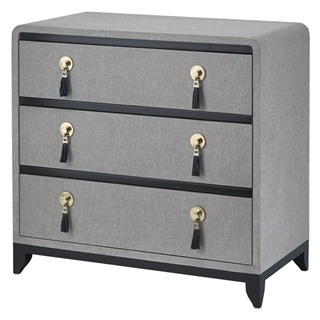 We spied the contemporary Nicolene chest from Currey and Company in a recent article by Patricia Sheridan in the Pittsburgh Post-Gazette. According to Cecil Adams, creative director, “fringe is never completely out of fashion”. He went on to say that “they chose to embellish this chest with modern brass pulls and leather tassels as a nod to handbag hardware.” On the other end of the spectrum, we found this over-the-top lampshade at www.vintageshades.com a company that specializes in making custom Victorian style shades and reproduction antique lamps. One of their lamps would certainly go well in the Gingerbread Cottages we last wrote about! Fringe and tassels add visual interest and are always in style – from ultra-modern to traditional to Victorian, there is something for all tastes. Our client was so pleased with this beautiful bullion fringe! Beautiful, but awfully fussy for modern tastes! At the Highpoint Market last year, we noticed tons of huge light fixtures, and we see this trend continuing this year. Oversized lighting fixtures can create bold and bright focal points in a room. Light fixtures are considered to be “oversized” when they are much larger proportionally than the pieces surrounding them and the actual dimensions of the room. It is a common misconception that the space needs to be a large one to incorporate a large light fixture – in actuality, filling any size space with oversized furnishings will make the space feel grander than it is. Proportionality is an important design principle we try to follow, but sometimes, breaking the rules leads to a truly interesting space, and, in the case of oversized lights, we love their visual excitement, quirkiness, and element of surprise. It can be fun to add one supersized piece to an otherwise balanced and proportional scheme to add a bit of drama or draw attention to one area. Photo of Ellen next to a huge chandelier at Highpoint Market - this is the giant light fixture that started us thinking about this blog. Ellen found this big old light in an antique store. It is a great example of how what is “old” can be “new” again!